While it’s certainly not going to take the place of any of my hunting guns, I was pretty impressed with the product and think it’s a great addition for those who have room in their bags. The Survival Slingshot is a 21st-century slingshot that has more in common with modern bows than it does the slingshots of your childhood. 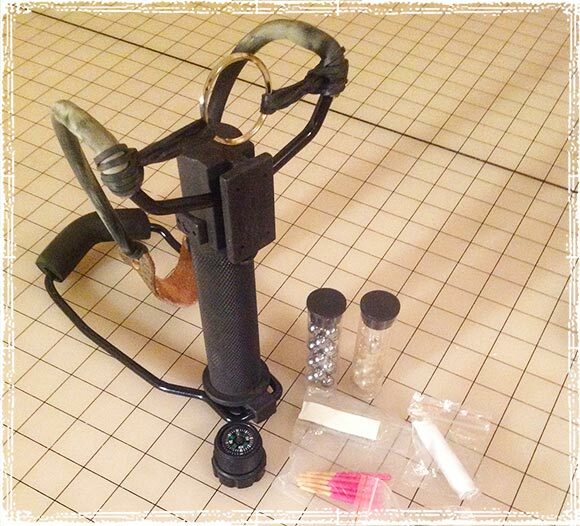 Fitted with a custom rails system, this slingshot allows you to easily mount accessories like a tactical flashlight, a Whisker Biscuit for firing arrows, or any weaver accessory. 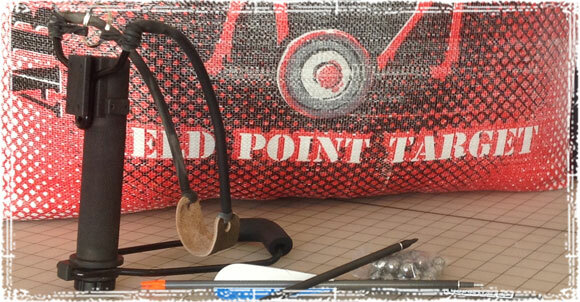 With a cast aluminum alloy handle, the slingshot doubles as a carrying kit for your ammo and some survival gear. When broken down, it’s compact enough and light enough to comfortably fit into pretty much any bugout bag or hunting bag. 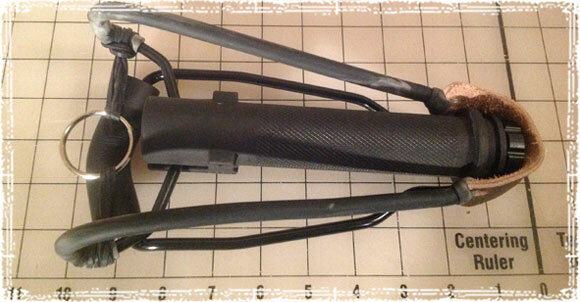 Hollow Handle: When I first unboxed the slingshot I was a little worried. I am not a fan of hollow handles, especially on things like knives, so when I noticed the hollow handle I had some reservations. I simply refuse to even look at a knife that has a hollow handle, but after using the slingshot I was pretty surprised to find the hollow handle did not affect the durability at all. 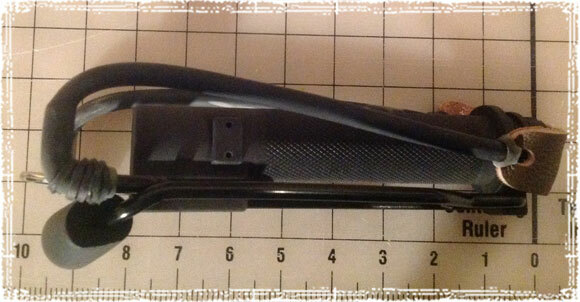 The handle is large enough to slide in two plastic tubes filled with either extra ammo, or the included survival gear. It’s then capped with a threaded compass. Overall Construction: This is not a child’s slingshot, and it’s unlike anything you’re going to find at a normal store. The slingshot itself is made with aerospace grade aluminum alloy and high strength steel and then fitted with a 25-pound-pull high-grade surgical tubing band. The moment I put this thing in my hands I was pretty darn impressed. This thing is solid, and it’s not at all what I expected. The quality and construction, combined with the lifetime warranty, make this the toughest and most reliable slingshot I’ve ever seen. I must emphasize, this is not a toy and is not something I would recommend giving to a child. It’s a serious tool that in the wrong hands can be a very dangerous weapon. The downside to this, and any other slingshot you’re going to find, is the bands. While the included bands haven’t given me any problems, they can and will eventually fail. If you’re going to be carrying the slingshot, you probably want to carry an extra band or two. If you notice any cracking, or any signs of weakening, you need to swap out the bands immediately. 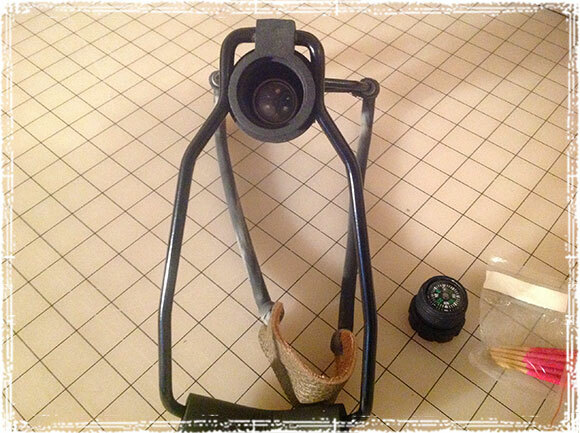 Shooting Accuracy: With practice, the Survival Slingshot is a real and even deadly accurate hunting tool. While I haven’t used it enough to call myself an expert, I was able to reliably hit my targets with accuracy and repeatability. One word of warning is to make sure you’re careful when shooting. This thing packs a punch, and the included steel ball bearings will ricochet if they hit a solid wall or solid object. With the base model Starting at $50 , the Survival Slingshot is an affordable and a pretty darn reliable tool that can improve your chances of hunting during certain situations. Its compact solid construction makes it a great addition to any hunting or bugout bag. We need to remember if faced with a situation where you are on foot, it may be wise to not make alot of noise that might give up your position. Sling shots, bows, throwing sticks, even rocks can bring down game. Think about things that you can carry that are not an apparent threat from a distance. If you are carrying a long gun, it’s lime waving a flag and can be seen from a distance, leaving you vulnerable to ambush. Tomahawks, knives that can be made into spears etc. In a primitive world, be prepared to be primitive. Your not kidding flintlock63. Stealth is a must but so is guild. Cast your own lead balls… they don’t ricochet at all. safer for practice. Use jaw breakers or gun balls for practice. They share and are biodegradable. Cheap too. This slingshot looks like it could be a great thing to have for the outdoors. I can see myself packing it in my hiking back, so if I need it, it will be there. It looks like it would be a great way to scare off animals or to go hunting. I’ve used a Barnet Black widow for years, use the right ammunition for the target you aim at, lead balls for hunting and training = massive damage and safer because of lower ricochet risk, steel balls for harder targets, arrows for hunting and small ball bearings bunched together in loose tissue paper for taking birds in flight or even as a distraction,,, that’s how i use mine but pepper balls for paintball guns also work well too apparently. So as a self titled slingshot expert, from my childhood expierence, I will say that in the last 20 years slingshots have changed significantly. I had a couple wrist rockets of different brands and I could put rocks or ball bearings through glass bottles and even once THROUGH a car windshield with a slingshot bb. The bands are no longer made like this, with the strongest hunting band from academy or other outdoors stores I cant even break a beer bottle.